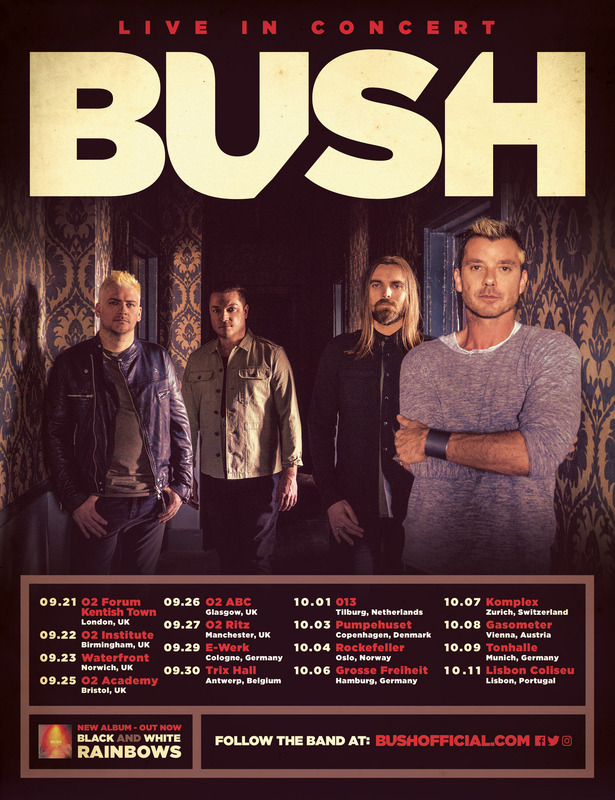 BUSH Official Website : NEW SEP/OCT EUROPEAN HEADLINE TOUR ANNOUNCED! Armed with their 7th studio album, BLACK AND WHITE RAINBOWS, BUSH have announced their first European headline tour in 4 years, which includes 6 UK dates, beginning with a show at The Forum on September 21st. As Gavin Rossdale was lighting up TV screens this past spring as his work as a coach on The Voice UK, BUSH also played rip-roaring homecoming show at a sold-out Shepherd's Bush Empire in March, tearing through a set list packed with classic hits and new favourites with Gavin once again proving why he is one of the best frontmen in rock. To date, BUSH have sold over 20 million records, and have also had an incredible 18 Top 40 singles at radio. BUSH's debut album Sixteen Stone went six times platinum, and their follow-up Razorblade Suitcase hit #1 on the U.S. charts. Gavin also found Top 40 success in the U.S. with solo album, Wanderlust, and more recently BUSH have released 2011's The Sea of Memories and 2014's Man On The Run. In 2013 Gavin received the prestigious Ivor Novello Award for International Achievement in Songwriting, which was presented to him by Coldplay's Chris Martin.